At some point in your life best friends and boyfriends will clash. Learn the girl code and how to lay out rules. Explore what to do if your bestie and man are too friendly. Let our dating coach be your guide in the world of best friends and boyfriends. Every set of best friends has at some time or another had to address boys. This is how the "Girl Rule" came into play. 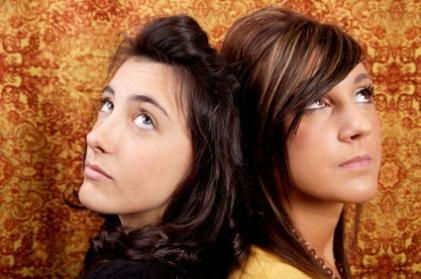 The girl rule says that as long as one best friend likes a boy, the other friend can't do anything about it. This doesn't mean she can't have feelings for him, it only means she won't act on those feelings. The thing about the "Girl Rule" is that it works the best with best friends. That's because best friends are willing to do what it takes to maintain the friendship. Knowing that your best friend cares enough about your friendship to not ruin it will make it a little easier to bring up the subject of boys. Up until now you and your best friend have shared everything, no secrets. This is what makes a best friend a best friend. Now your relationship with each other has progressed to the next level of friendship, "the rules" level. To tackle such a difficult topic, I would suggest that you bring up the subject in person and not over the Internet or on the phone. You can start talking about boys with a little girl gossip, i.e. who's popular and who's not or who likes who. Then move the conversation to what ifs. What if a girl likes a boy and he doesn't like her, would it be ok for her best friend to like him? What if a girl had been in a relationship with a guy and the relationship ended, would it be ok for her best friend to start liking him? After talking about the different what if scenarios you each can think of, you can then suggest that you have "Girl Rules" to protect your friendship and recommend some ideas you think are important. You can have girl rule # 1 and girl rule #2, etc. Write the rules down for each other so there is not confusion later on. Once you have all your rules in place, you can move the conversation to each of you sharing your current boy likes and which rules apply. This will give you an opportunity to talk about the boy you wrote about and how you feel about him. Girl rules don't always work in friendships. Sometimes a friendship will end over a boy. But, having rules will reduce the likelihood that any boy will come between best friends. My guess is your friends had been confiding to liking this guy while you implied that you were not very interested in him. You did this by hinting that you were interested in other guys. Then, without your 'close' friends knowing, you and this guy started talking more frequently and then started going out on some dates. You did this without sharing the news with people you call your close friends. My guess is their reaction to you about this is coming from feeling deceived by your secrecy. There is no unwritten rule out there that says you can never be interested in a guy or date a guy that your friends are interested in too. However, there is an expectation in friendships that you share personal information with each other. You treated your close friends as if they weren't so close. Then you expected them to react positively to the news that you and this guy were together. No fair! What have you done wrong? You didn't behave like a 'good friend.' You kept secrets, you got defensive, and you blame their hurt reaction. This is why your friends are angry. They're hurt and disappointed by your lack of openness and honesty. It is up to you to initiate a talk with your friends and own up to not being a good girlfriend. Talk to them about why you didn't share your interest in this guy and led them to believe you were interested in other guys. Explain what kept you from telling them about you and this guy talking, hanging out and dating sooner rather than later. Then, without getting defensive, listen; really listen to their hurt feelings about your behavior. Once everything is out in the open, take responsibility for your behavior and let them know that you will do your part to be a better friend. Being a close friend means being vulnerable. You do this by sharing personal information about yourself as well as being a good listener to others. Moreover, you don't judge your close friends; you accept them for who they are, warts and all. Should Friends and Boyfriends Mix? I once had a best friend and a boyfriend that were very friendly. When I couldn't go to his games, she would go. At first, I thought their friendship was innocent even though my gut kept telling me something doesn't feel right. Soon I started to request that they not spend so much time together and it was then that I learned their friendship had blossomed into something else. I felt deceived and betrayed. I also felt embarrassed that I was the only one who didn't know what was happening until it was too late. While I am not saying that my situation is what is happening in your case, I do think that this guy became more interesting when your relationship with him got serious. That was just enough to ignite some jealousy in your best friend. From your boyfriend's perspective, he gets two girls for the price of one. I think there is a lot of electricity between you all. Where there is smoke, there is fire. This means only time will tell if your best friend and your boyfriend will be able to keep their relationship platonic. You need to listen to that little voice inside you, it's telling you something. Whether that something is jealousy or suspicion, I can't tell. If you don't feel good about the friendship between your boyfriend and your best friend, you need to pay attention. The same holds true for how these two people are treating your friendship. They replied to your concerns by saying they have a right to be friends. This is true, but it may be at the expense of your friendship. This is something only you can decide. Real friends don't ignore the feelings of a friend who is hurting, they listen and change.